THE SKINNY: My boyfriend could not stop smelling my hair -- seriously! 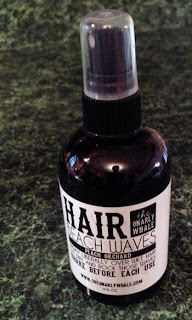 Trying to take advantage of an East Coast Indian Summer, I broke out The Gnarly Whale's Beach Waves in Peach Orchard. My hair smelled amazing and I had the best, softest natural looking waves ever. And did I mention how great it smelled? I liked that the product only required a couple of spritzes to get the effect as well. Plus the waves were light and soft, not crunchy and hard like some other similar products. Plus this is a company that you can feel good about supporting with your purchase. All of The Gnarly Whale products are 100 percent vegan and cruelty free. The company also uses natural antioxidants as preservatives in most of their products, and printed materials are made from recycled materials and paper. CHECK IT OUT: The Gnarly Whale is a small independent company selling on Etsy. I see big things ahead for these guys.